Feature: Is Print Really Dying? 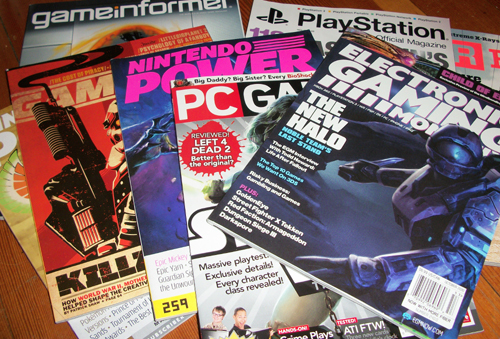 It’s pretty rare that I’d devote half a year to a single article, but I’ve been working on a piece exploring the different angles of the so-called “Death of Print” ever since I sat in on a panel of the same name at PAX East. Though that panel discussion was quite interesting, I wanted to take a broader look at the subject and gather perspective from other editorial folks across the gaming industry, so I spent quite a bit of time wrangling interviews. Though the finished piece was originally slated to run in a print issue of GamePro, the decision was made to have it only appear on GamePro.com. It’s ironic, perhaps, but I’m glad to see it finally out, and I’m really happy to see it has retained its massive length. Many thanks to the excellent editors who took the time out of their busy schedules for interviews for the piece. Feel free to mosey on over to check out the full feature here at GamePro. This entry was posted in GamePro and tagged ben kuchera, billy berghammer, chris dahlen, commentary, dana jongewaard, death of print, editors, Feature, game industry, game journalism, game journalists, GamePro, gary steinman, IGN, is print really dying, john davison, print industry, print is dying, print magazines, ziff davis by nmeunier. Bookmark the permalink.